In Perquimans Country in Eastern North Carolina just off US Highway 17 lies the town of Hertford. 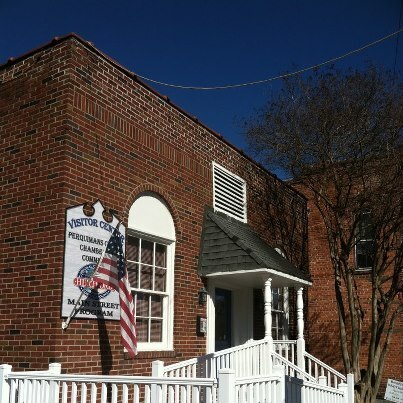 The town has was incorporated in 1758 as the county seat for Perquimans county. A lumber town it is about an one hour drive from Norfolk Virginia and under 15 minutes from Elizabethtown North Carolina. The traveller who remains on US 17 misses out on the beauty of the town, though not an Interstate Highway, the main route 17 provides the unknowing traveller no reason to think of the treasures that lie within the little town of just over 2100 inhabitants. However, to those that are willing to get off of the main highway the little town is a throwback to a period and time much like the fictional Mayberry of the Andy Griffith Show. The town is the location of the one of a kind swing “S” bridge in the United States on which North Carolina Highway 37 crosses the Perquimans River. It is the site of a 1825 Federal Style courthouse and a number of Colonial Queen Anne Revival homes. It is also the place where the great American Disc Jockey “Wolfman Jack” made his home, died and is buried. 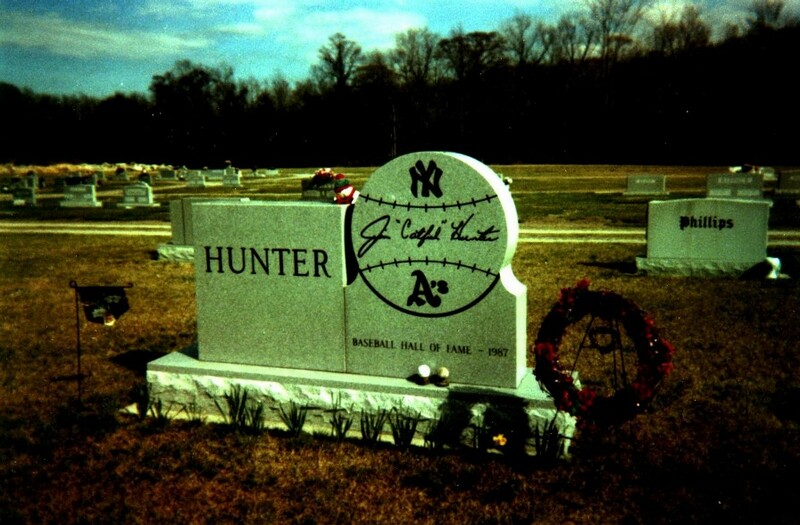 But to the baseball faithful the little town is the home of a baseball legend, Jim “Catfish” Hunter who died there at the age of 53 in September 1999 to the ravages of Amyotrophic Lateral Sclerosis (ALS) commonly known as Lou Gerhig’s disease. 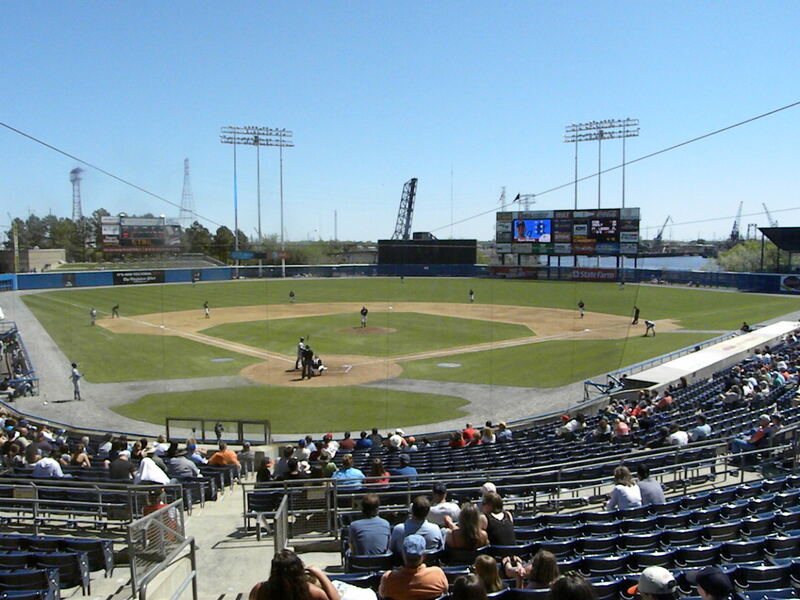 Hunter grew up in Hertford where he was a star baseball and football player at Perquimans County High School. 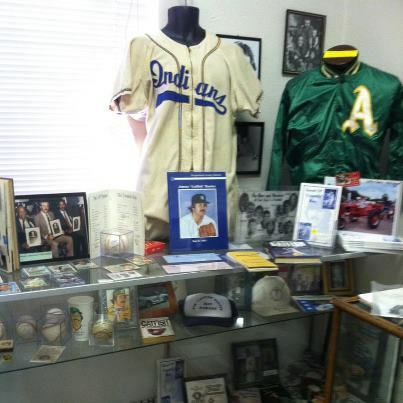 His talents led Charlie Finely, the owner of the then Kansas City Athletics to sign him in 1964. Though unable to pitch that year the young Hunter, nicknamed “Catfish” by Finely never played a game in the minors and began his career in the Majors, gaining the first of 224 victories against the Boston Red Sox on July 27th 1965. Hunter’s on field performance was nothing short of amazing. At the age of 22 he became the youngest pitcher to pitch a perfect game, the 9th in MLB history on May 8th 1968 against the Minnesota Twins. During the game Hunter was also the hitting star of the game going 3 for 4 with a double and a bunt single RBI that provided the first and what would be the winning run. 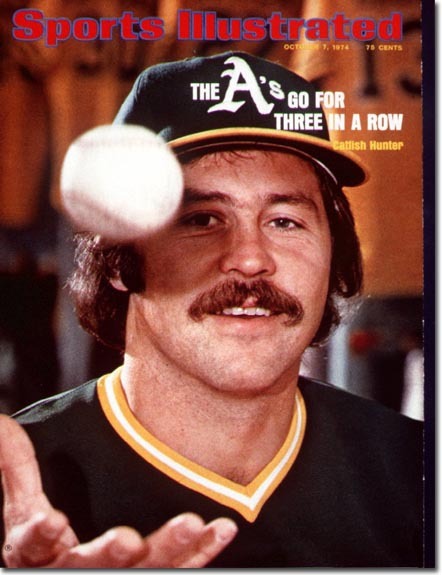 Hunter pitched five consecutive twenty game win seasons between 1971 an 1975 with the Athletics and Yankees. He was a 8 time All-Star, 5 time World Series Champion and he won the AL Cy Young award in 1974. I had the pleasure as a kid of seeing him pitch in person on a number of occasions during his time with the Athletics, the first time against the Angels in Anaheim in 1970 and also during the 1972 ALCS against the Detroit Tigers in Oakland. 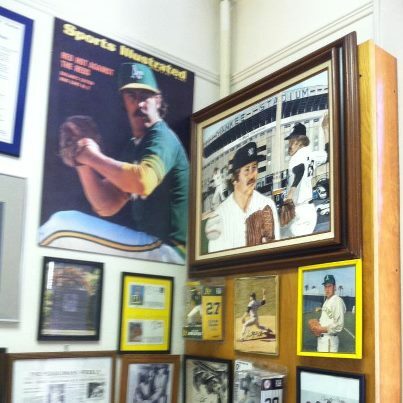 My visit to the Jim “Catfish” Hunter Museum in Hertford was something that I have wanted to do for a couple of years. In Hertford Hunter is still affectionately known as “Jimmy.” This is something that is unique to the people of the area who Hunter was close to. 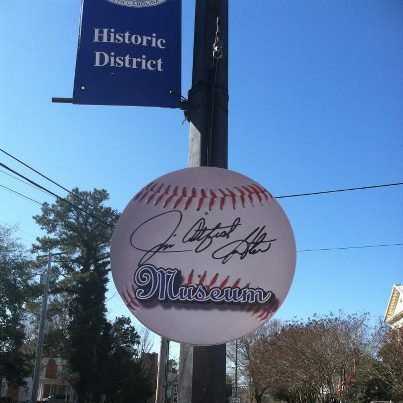 To them, he was and still is “Jimmy” a friend who devoted his life both during and after his baseball career to the people of this quaint town. 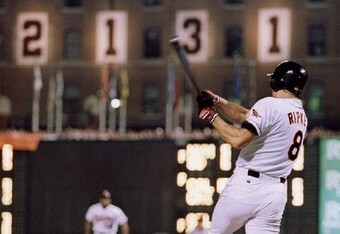 To most baseball fans Hunter is remembered as a great player. However, to his friends and neighbors in Hertford he was much more. 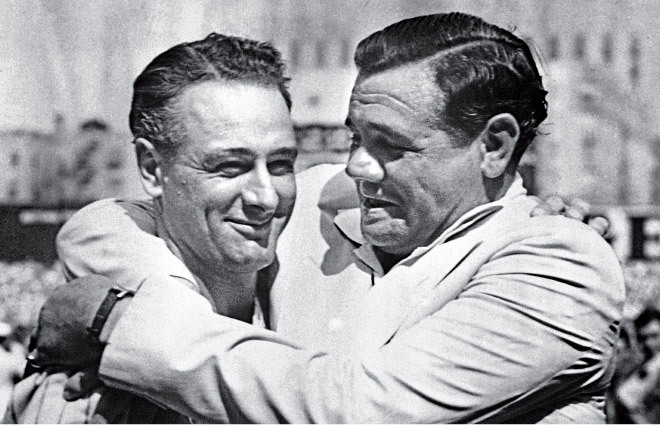 He was a mentor, friend and helper. 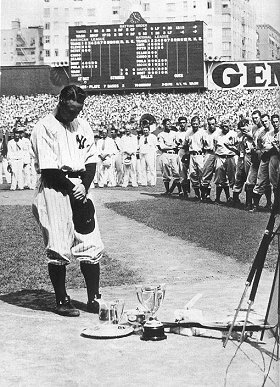 His unexpected death in 1999 shook the community and the baseball world, especially his former teammates, a number of whom quickly changed their schedules to be in Hertford to be with Jimmy’s family. Former teammates present included Lou Piniella, who was then managing the Seattle Mariners, who missed his team’s game in Baltimore to attend the service at Cedarwood Cemetery. 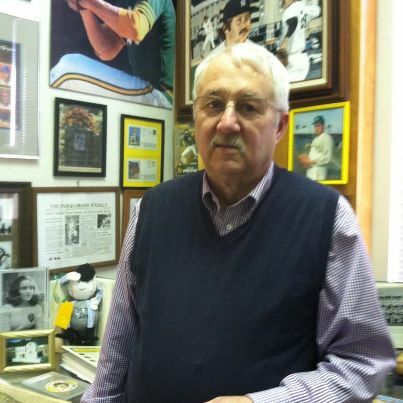 Other former teammates who attended the funeral included former A’s Joe Rudi, Vida Blue, Gene Tenace and “Blue Moon” Odom, and Yankees Ron Guidry, Jim Spencer and Reggie Jackson, who took a cab from Norfolk to get to the funeral on time. Attended by over 1000 people the funeral was the largest in the history of Hertford. Two short but interesting television segments about the museum are provided in the links below.